Design manufacturability is not a just designer's problem, nor is it just the fab house's problem; it's everyone's problem. 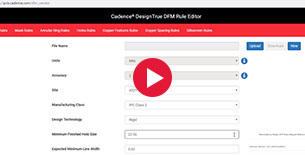 Cadence® DesignTrue DFM technology helps layout designers validate manufacturability and shorten design cycles. Designers can check DFM rules in real-time while designing so they can get their design right the first time. But any rule check is only as good as the rule definition. Your manufacturing process is unique to you. And you deliver results no other fabricator can because you're pushing the rules. As a member of the DesignTrue DFM Partnership Program, you can easily share your unique design rules with your customers. You'll spend less time going back and forth, and you'll produce better results for your customers. Create DesignTrue DFM constraints that match their post-process DFM checks, ensuring one-to-one-compatibility based on technology, material, and spacing. Easy distribution of constraint file ensures your customer’s DFM checks match your fabrications rules with significantly less manual communication. Rules are checked as part of the PCB design process, greatly reducing the amount of DFM errors in the manufacturing outputs. This prevents crucial manufacturing errors and limits the back and forth normally required to fix such errors. Allows faster production times with greater repeatability. Your company gains exposure on the Cadence website as a DesignTrue DFM partner and links back to your web page.